While our boat was leaking water, the paint was being sandblasted off of it, and money was being spent at a high rate of speed we moved out of our apartment. We had gotten someone to sign a new, 14 month lease so we could break the lease that still had 7 months left on it. An adventure! We moved what was left of our things into their basement and are sharing the duties of living in a two bedroom house amongst the four of us. We call it The Commune because, really, we have to laugh at the absurdity of the situation. Combine all ingredients except turkey in a large bowl and mix thoroughly. Add turkey and stir to combine. The mixture will look wet and will hold together well. Heat 2-3 Tbs of olive oil over medium heat in a wide, shallow pan and drop small spoonfuls of the turkey mixture in once the oil is hot, keeping space between them. Flip the meatball/patties to brown on both sides and remove to a plate. Keep making small batches of meatball/patties until all the turkey is used up, adding more oil if needed to prevent sticking. They can be served as-is (make sure they’re cooked through if you choose this option) or finished with a marinara or barbecue sauce. I combined 1c. ketchup, 1/4c. 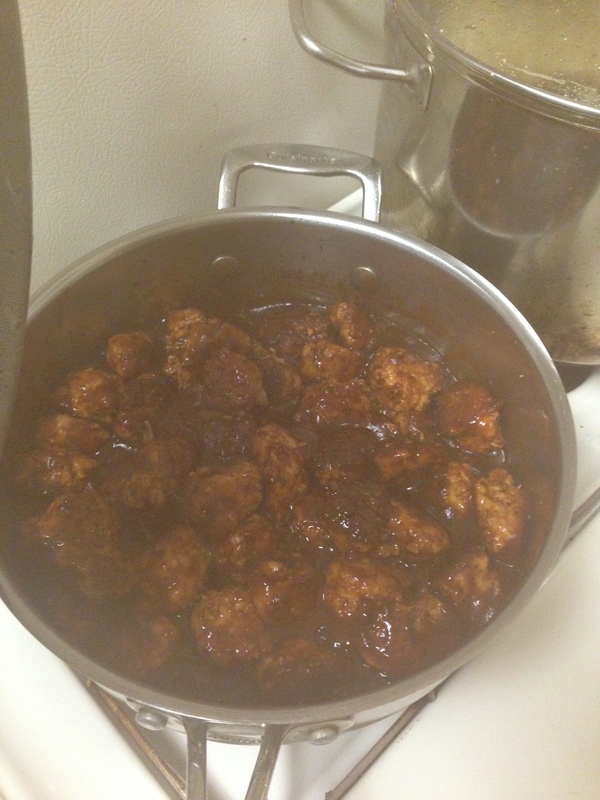 molasses, 1Tb honey, and 3Tbs balsamic vinegar, heated through and added the meatballs back to simmer. Coat completely with sauce, transfer to a plate and serve with toothpicks. Previous Post What have we done?